There’s something special happening inside a Creole cottage nestled in the quaint New Orleans Garden District neighborhood. Pass on a weekday, you might not notice a thing. Take a peak through the windows on any given Thursday, Friday, or Saturday evening, you'll find 24 smiling faces around two candlelit wooden tables passing dishes as if they were one big family. There are no frills, no fancy trappings, only the necessary amount of silverware. There’s a woman with bright eyes, standing humbly in a T-shirt and overalls, telling guests the name of a local fisherman or crabber who caught what they were eating. It’s honest. It’s true Southern hospitality. It’s Mosquito Supper Club. The bright eyed woman is Chef Melissa Martin who started Mosquito Supper Club to share the cuisine she grew up eating in Chauvin, Louisiana. 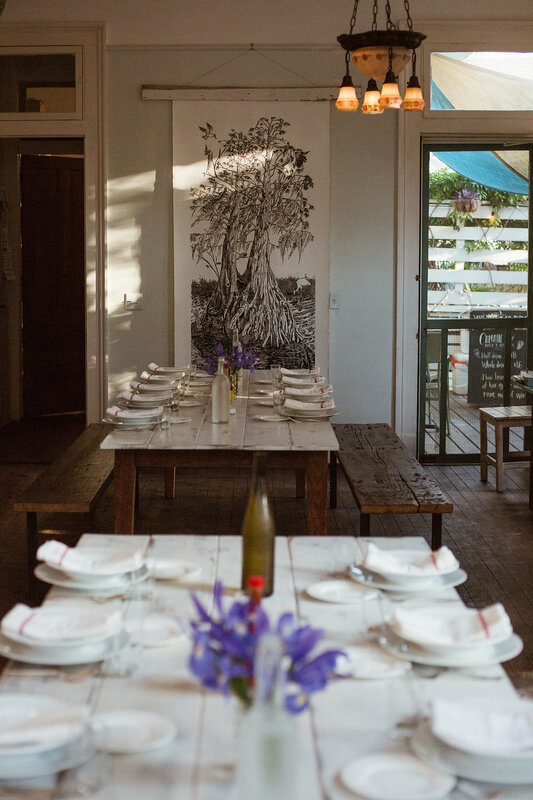 Serving a five-plus course meal of food that’s seasonal, sustainable and quintessentially Cajun, she’s created a space that celebrates the experience of gathering at a table and breaking bread together (literally, the hot rolls are delicious)—something that has connected from the beginning. There’s a nostalgic familiarity in the air upon entering Mosquito Supper Club. Expect to be greeted as an old friend by strangers and staff alike who are uncorking bottles of wine and quick to introduce themselves. Surrounded by fences of jasmine and magnolia trees swaying overhead, guests start the evening at 7:30pm on the back patio with a cocktail and a starter dish. When Martin’s right hand woman, Ellen Durand, announces dinner, they scurry up the stairs as if grandma had just called everyone to the table for Sunday brunch. Dishes are passed, shared and devoured, and so are stories. It’s loud; glasses clank and laughter bellows as strangers turn to friends over glasses of wine and crab legs. As dinner finishes up three or four hours later, Martin mingles with guests and thanks everyone for joining dinner.